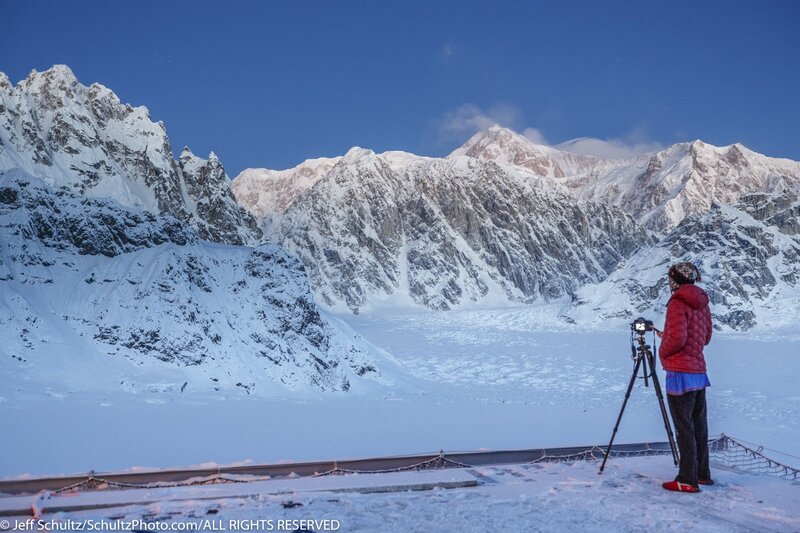 Experience a one-of-a-kind opportunity to travel to, photograph in and stay 4 days and 3 nights high up in the heart of the Alaska Range, surrounded by glaciers in the newly built luxurious Sheldon Chalet on the Ruth Glacier at the base of Denali (aka Mt. McKinley). 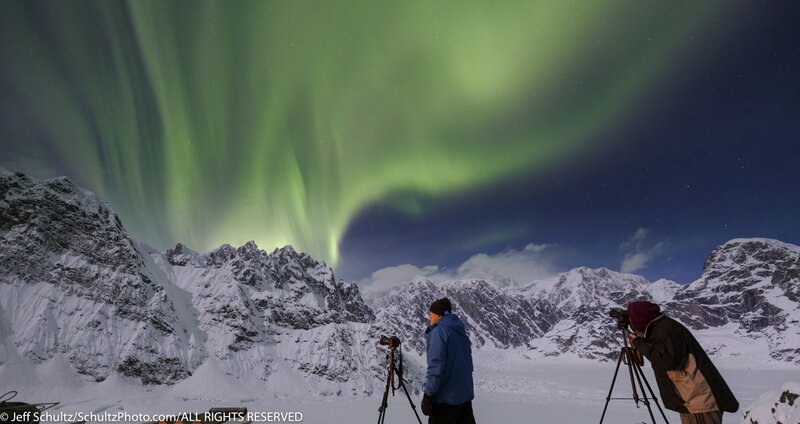 Photographic opportunities abound amongst towering granite spires, snow-capped mountains, surrounding glaciers, ice falls and the potential of night-sky and northern lights, and of course a one-of-a-kind view of Denali. 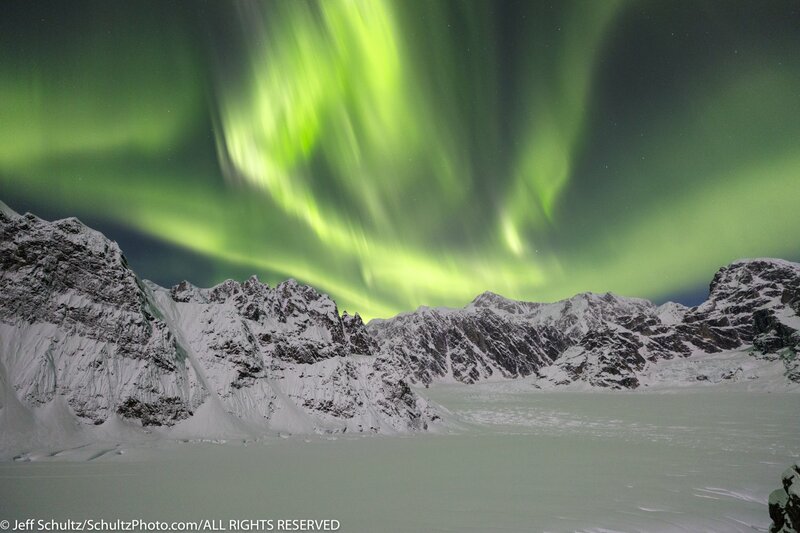 The opportunities for Aurora and night-sky photography are perfect here. After a short drive from Anchorage, this epic adventure begins in the historic village of Talkeetna, Alaska. 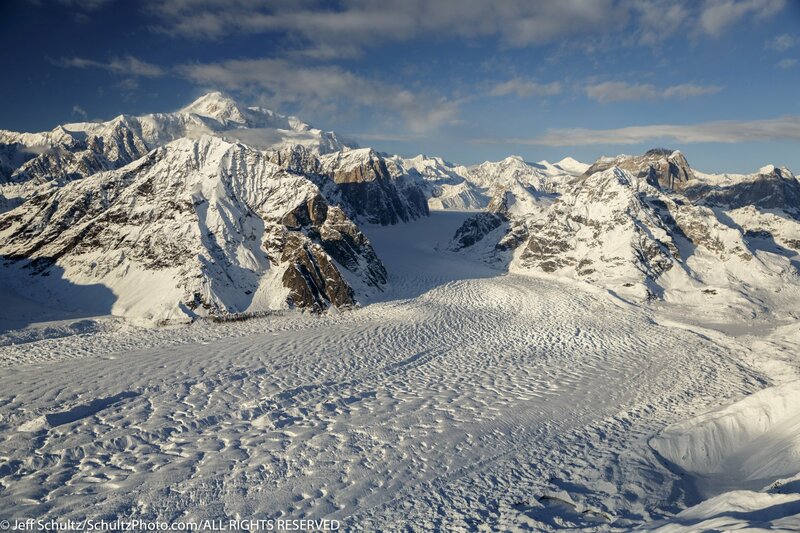 From here, we fly in a helicopter up the Great Gorge of the Ruth Glacier, where the bottom of the glacier to the top of the granite mountains is at a height exceeding that of the Grand Canyon ! 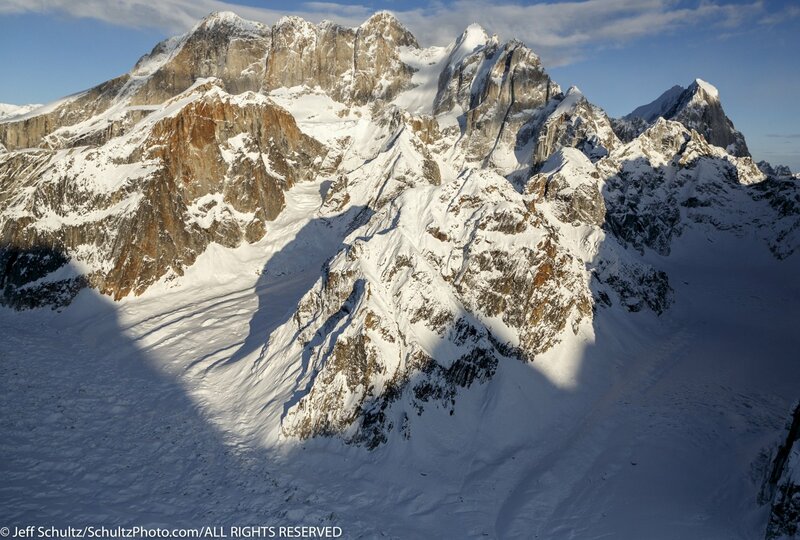 This spectacular opportunity for aerial images from a helicopter has not been available before. 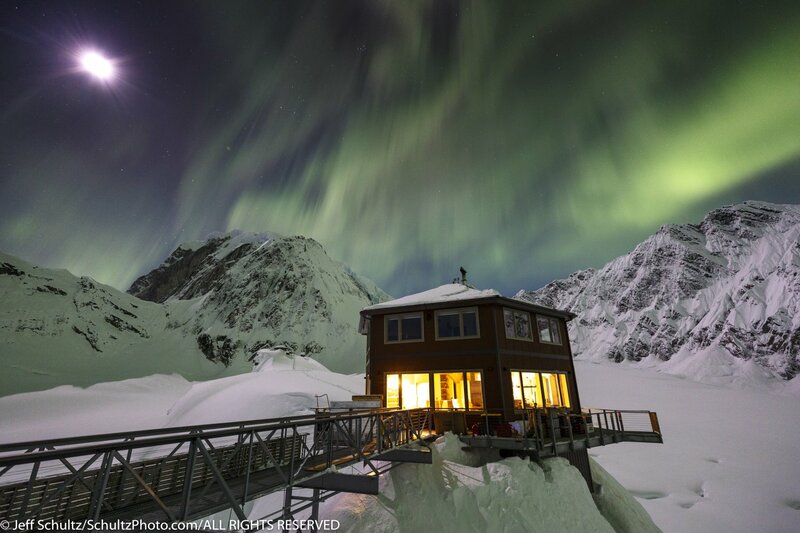 We land within steps of our home for the next 4 days and 3 nights at the Sheldon Chalet--- an engineering marvel with all the comforts of home, at the 6,000 foot level in the Alaska Range. The 360 degree view is nothing short of spectacular at this 5-acre slice of rock where the original 1966 Don Sheldon mountain house sits a few hundred yards away. 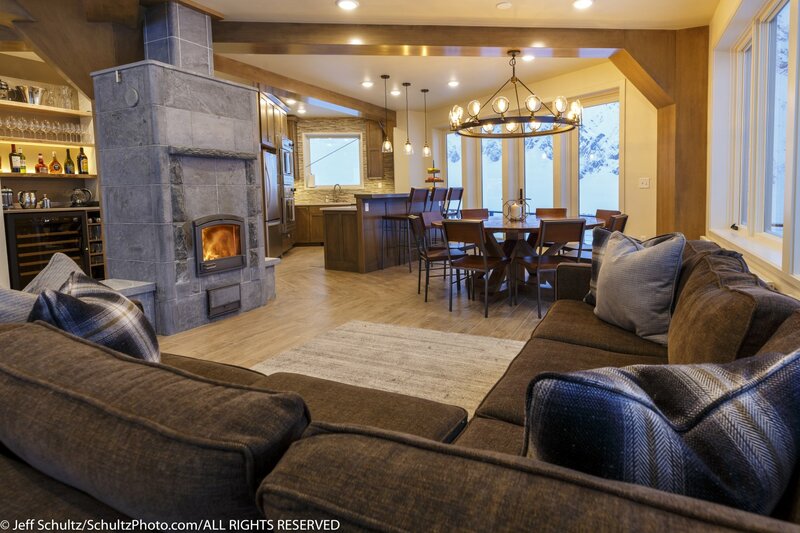 The Sheldon Chalet is luxury living and 5-star cuisine in this two-story, 5 bedroom, 2-bath lodge surrounded by granite and ice. A chef and housekeeper will take care of all your personal needs. 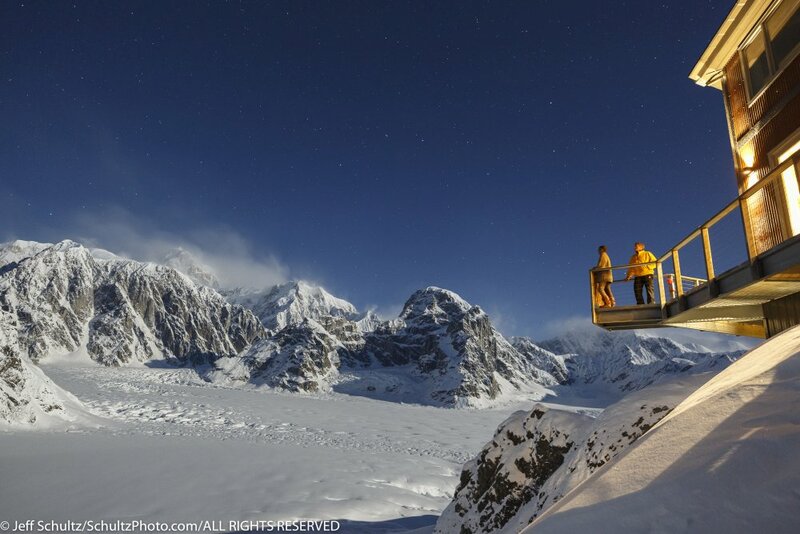 Daily we can venture out onto the glacier via snowshoes with our experienced glacier guides to photograph other areas of the Don Sheldon Amphitheater. This photo tour is perfect for the non-photographer spouse to enjoy the comfortable accommodations, great food and a view that is astonishing. 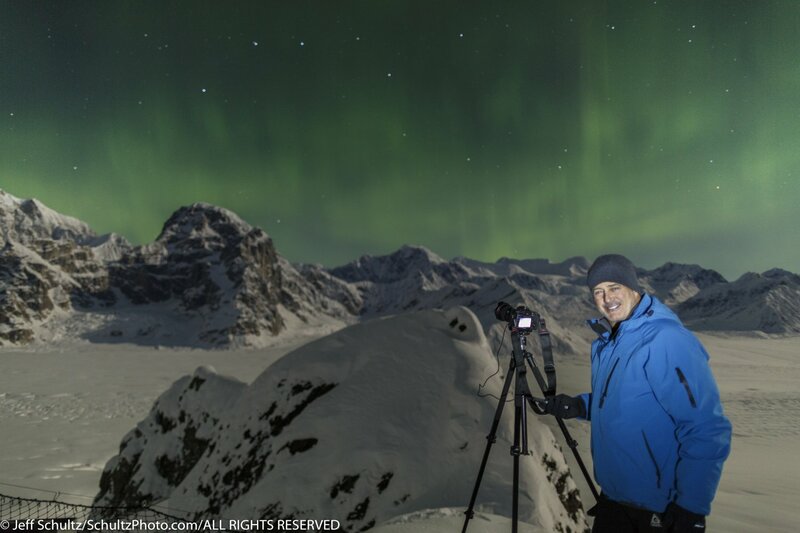 During this photo workshop-tour, your instructor is one of Alaska’s most published professional photographers, Jeff Schultz, official photographer of the Iditarod Trail Sled Dog Race. No matter what your photographic skill level is, Jeff will offer instruction that and will meet or exceed your expectations and allow you to take your photography to the next level. Snowshoe into the Great Gorge for more photo opportunities. Cost is inclusive of all meals, transportation, transfers, guides, instructor and luxury lodging. Arrive in Anchorage on your own before 3:30 pm. 9:00 am pickup at your Anchorage, Alaska hotel and transport to Talkeetna in a comfortable van. 1:30 check in to airport for weigh-in. 3:00 pm arrive Sheldon Chalet and settle in with orientation of location. Once at the Chalet, each day’s & evening’s activities will be dictated by the photographic opportunities, the weather and our group. 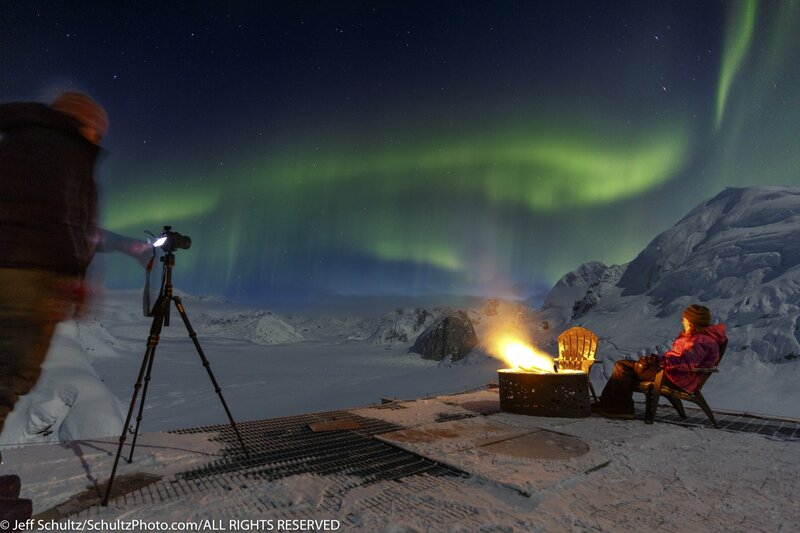 Photography done early in the morning, late evening and at night when the stars and northern lights are out. Each day’s & evening’s activities will be dictated by the photographic opportunities, the weather and our group. 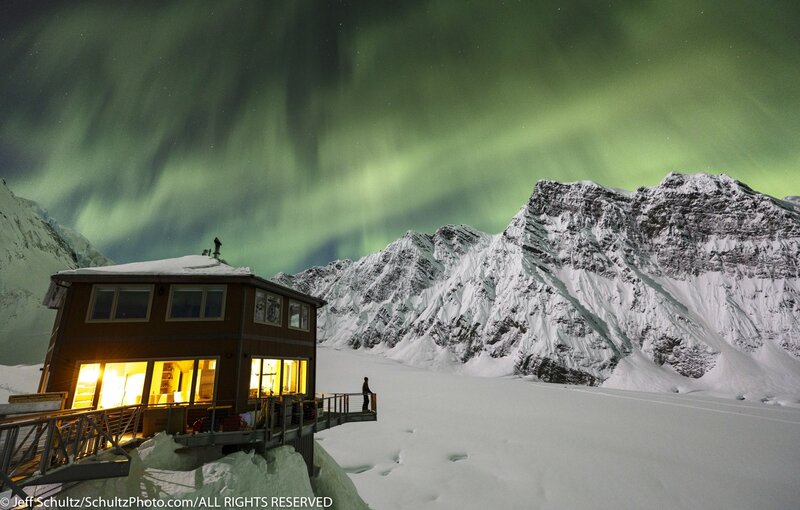 It may involve snowshoeing or hanging in and around the Chalet. 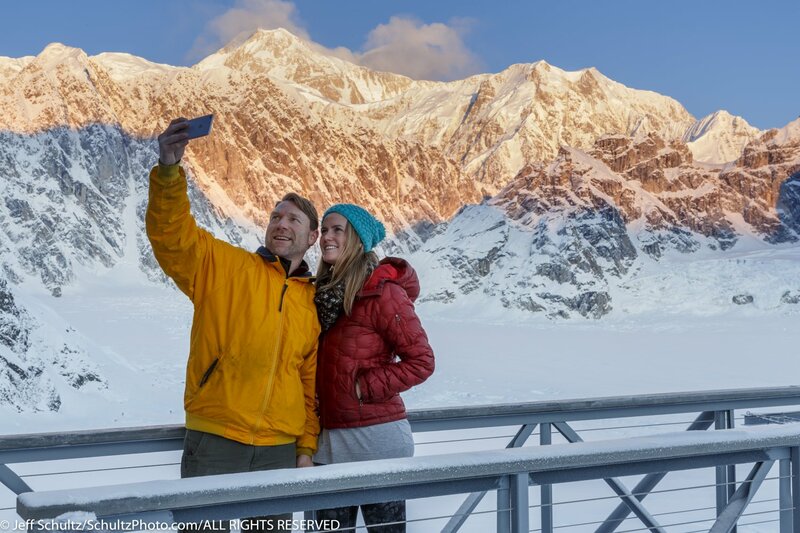 Our experienced mountain and glacier guides from St. Elias Alpine guides are available to take those from the group who would like to go via snowshoes into other parts of the amphitheater, into a crevasse or the like to get better vantage points. One does not need to do these adventures if not comfortable. Jeff will have workshop instruction time and image review at appropriate times throughout the day and evening. Jeff is also on hand during shooting times to answer questions and help with all your photo needs. Additional helicopter time is available at an additional charter rate for those wishing to do additional aerial photography and/or visit other locations. 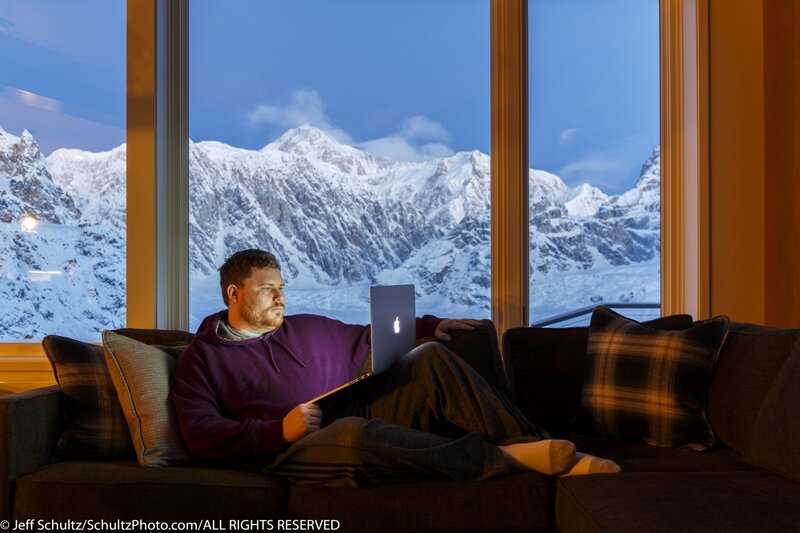 Drive back to Anchorage to catch your flight home or to your hotel. 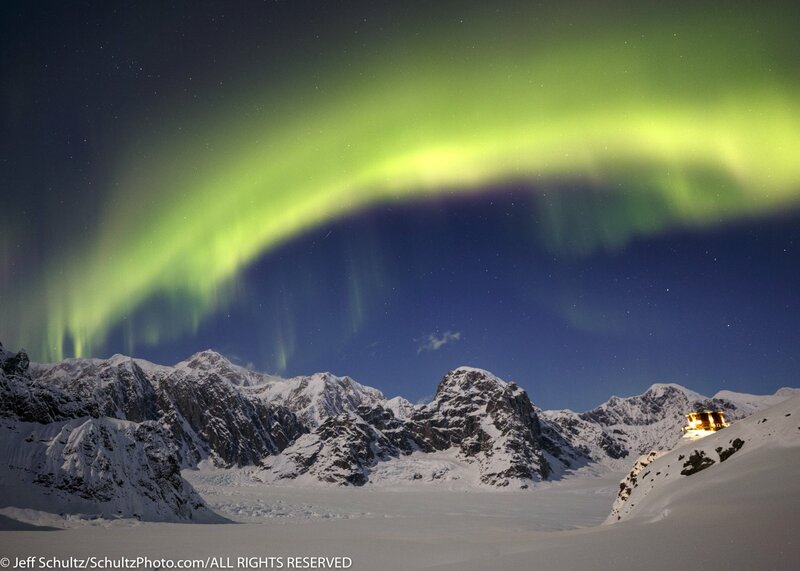 Night-Sky photography for stars, moon and northern lights. Besides two Canon camera bodies, Jeff brings lenses from 16mm-400mm flash with off-camera capabilities, tripods, polarizer and split-neutral density filters. Two tripods --- yes two. This additional gear is worthwhile bringing, but not absolutely necessary. Laptop computer with image editing/processing software such as Adobe Lightroom or Photoshop. Proper winter gear is necessary. All glacier travel gear including snowshoes, harness, ropes, carabineer’s etc. is provided at no charge. 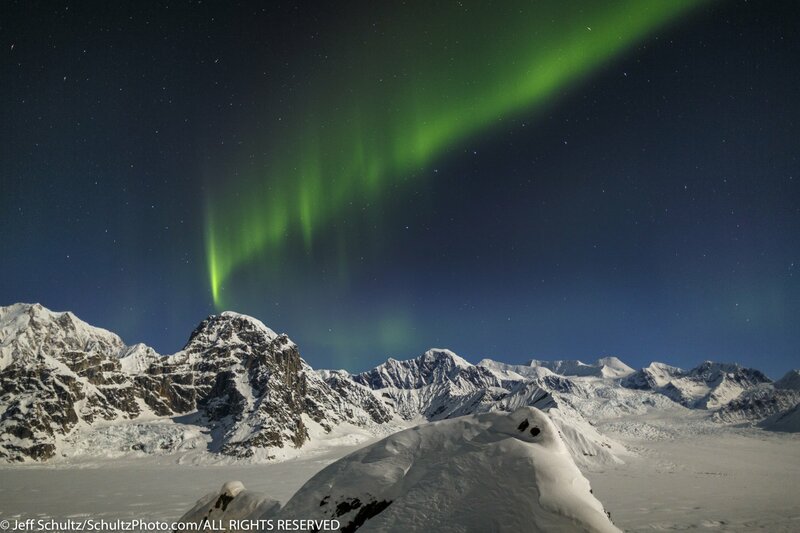 Round-trip van transportation from your hotel in Anchorage to Talkeetna and back is included. 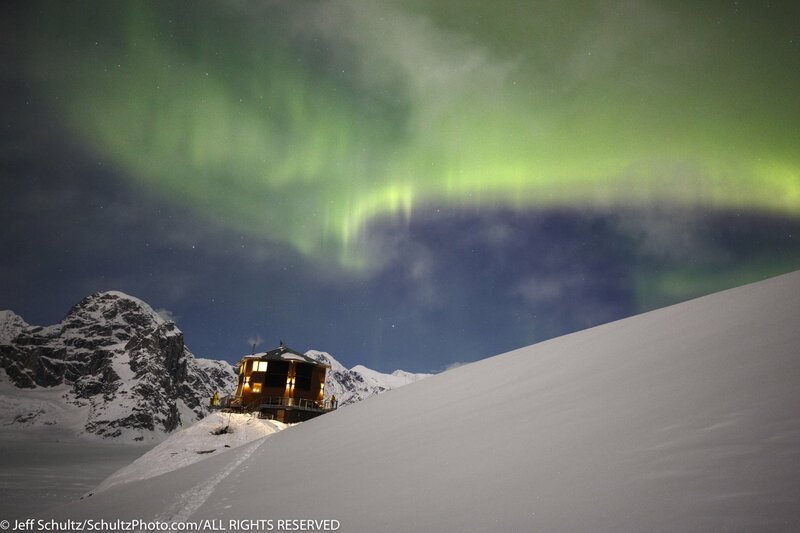 Round-trip air transportation from Talkeetna to the Sheldon Chalet is included. Note that all transportation, especially the air transportation is weather dependent. 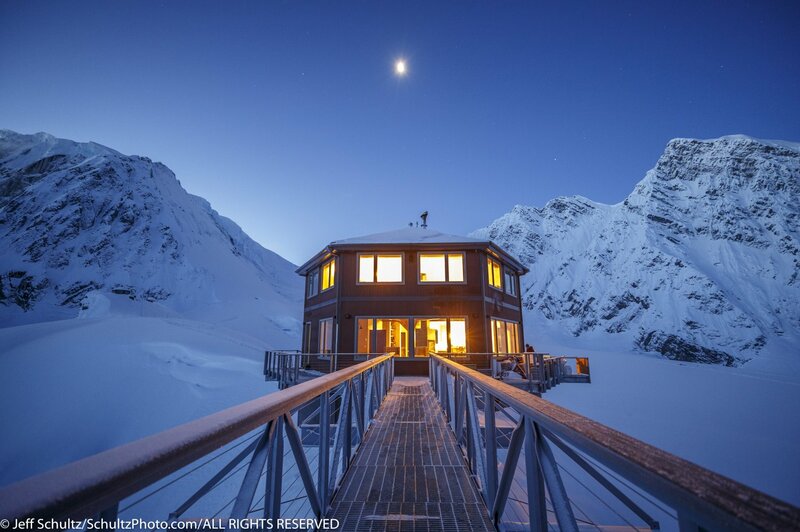 It is possible that the arrival day and/or departure day into and out of the Sheldon Chalet, may be postponed by a few hours or even as much as a few days if bad weather persists. We will make arrangements to provide accommodations and food for these contingencies. You will want to make your departing travel dates flexible in case we incur a weather delay. In Anchorage we will be staying at the LakeFront Hotel, (A millennium hotel) a 10 minute ride from Anchorage International Airport. 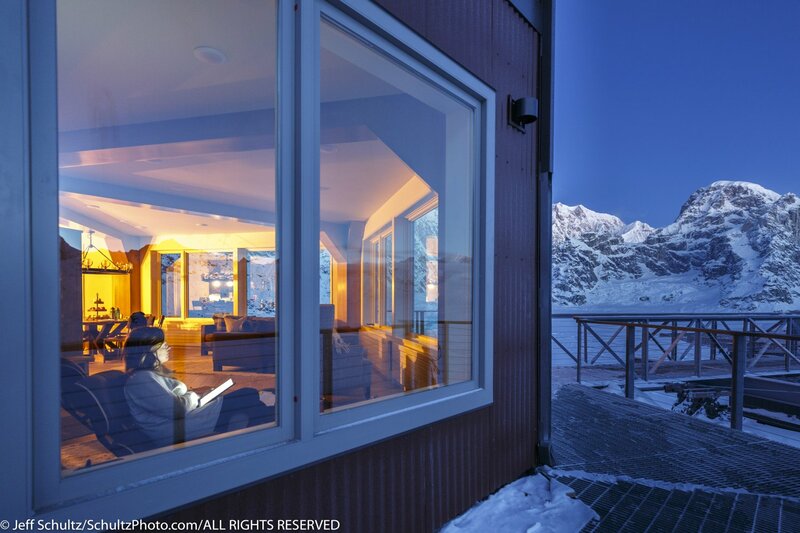 The Sheldon Chalet is a one-of-a-kind building in a one-of-a-kind location. Extreme Engineering combined with Extreme Luxury. There is nothing like this in the world. 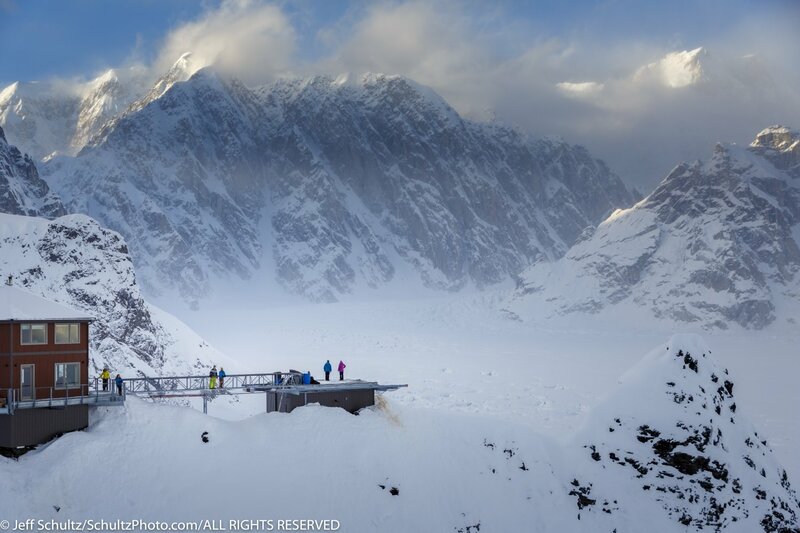 Anchored deep into the granite, iron and titanium of the rock, the Sheldon Chalet is not only a luxury destination—with running water, electricity, generous heat, and world-class food—but it is an engineering marvel. The view is spectacular from each of the 5 bedrooms, each with a King size bed (or two single beds) and plush linens. 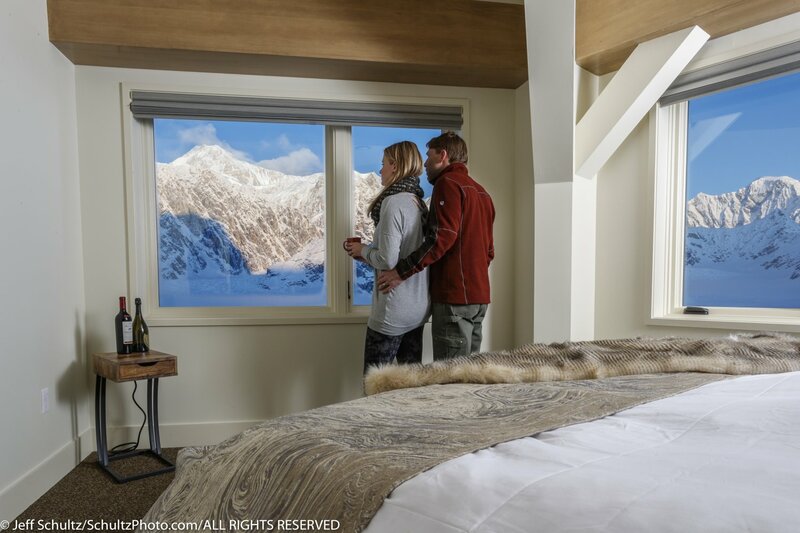 Each bedroom has sound-proofing construction and has an individual thermostat to make your climate needs perfect. There are 3 bathrooms, 2 with shower. A professional chef cooks each of your 3 meals per day. A housekeeper is there to attend to your needs. The generously sized, clean common area is on the main level again with a spectacular view from each window. Eat family style at a common dining table and enjoy appetizers at the bar. A reading area and sofa allow you to relax in comfort and style. We will eat well-prepared, fresh-food gourmet meals by the full-time chef of the Sheldon Chalet. Round trip ground transportation from Anchorage to Talkeetna and back to Anchorage. All meals from the first night dinner, through the last day lunch. Any personal gear. You must bring your own photography gear, clothing, toiletries and outerwear. There are weight restrictions on gear for the flight. A list of recommended clothing and camera gear as well as weight information will be sent after registration. Your safety is ultimately our primary concern. 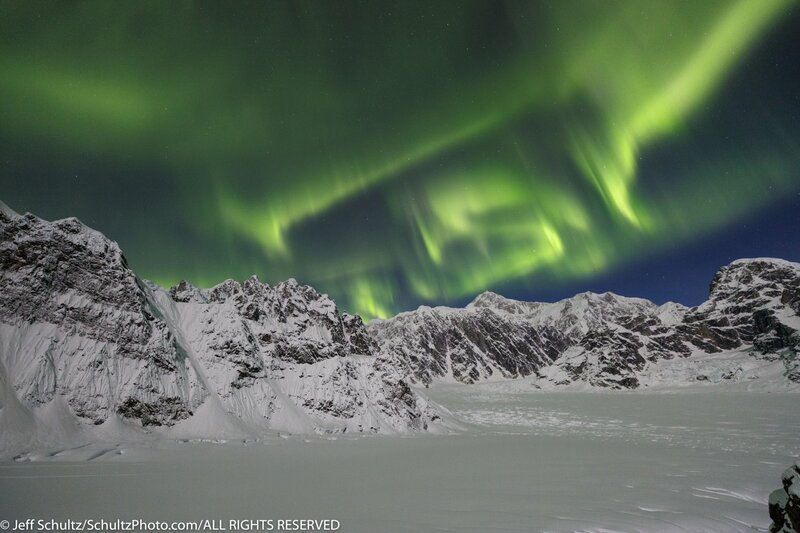 We use some of the best Alaska pilots and each carries the necessary full insurance as required. 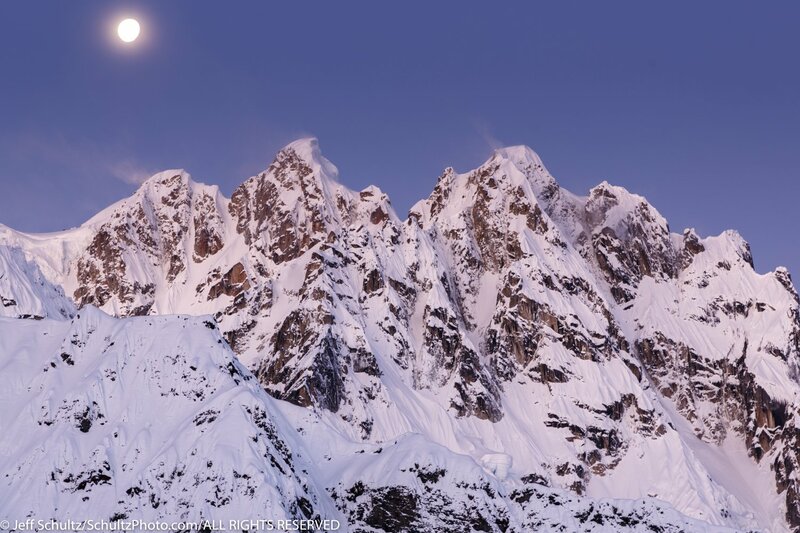 Likewise St. Elias Alpine Guides carry complete insurance and are qualified and licensed for Alaska backcountry living. Degree of Difficulty: Easy to difficult – depending if you decide to snow shoe or not. Weather Conditions: Moderate to extreme. March temperatures range from 30° F (-1° C) to MINUS -20° F (-29° C). May experience snow, wind or sun. Clients are required to inform us of health problems, allergies and physical limitation at booking due to the extreme remote location. All clients must sign a liability release waiver prior to the trip. * Please note that the purchase of Trip Cancellation and Trip Insurance (which includes evacuation insurance ) is highly recommended for this adventure. A 50% deposit is required at time of booking. $1500 of this deposit is NON-REFUNDABLE. The balance of the tour price is due 45 days prior to the trip, February 6, 2018. Should weather prevent you from flying to the Sheldon Chalet on your original departure date, you will be accommodated in beautiful downtown Talkeetna at the historic Belle's Cabin until air travel resumes. During this time we will photograph other opportunities nearby. Refunds are not given due to weather delays. Should more than 50% of your trip be interrupted by weather, we will roll your reservation to a future available date. Contact us directly now to check availability and book. Once confirmed the deposit can then be paid by check or wire transfer. After booking What’s Next? Upon booking we will contact you to confirm your space and see if you have any specific questions we can answer at that time. We will then e-mail you a list of other essential personal gear, any specialized photography gear we feel will enhance your experience, and more detailed information on where and when to meet for the first day. We will also ask for emergency contact information and medical information.